Many carpet cleaning devices can use a variety of cleaning agents help get your carpets clean. Even a small amount of liquid laundry detergent can be used to help remove dirt and grime from your carpets. This is a guide about using laundry detergent in your carpet cleaner. I am cleaning my carpets today, I ran out of store bought carpet cleaner, and I wanted get done. I knew if I left home to get more cleaner, I wouldn't want to go back to cleaning the carpet, so, I started looking around the house to see what I could use. I decided on my brand of laundry soap, Arm and Hammer with stain fighter, the scent was Clean Meadow. I filled an empty one gallon milk jug 3/4 full with hot tap water, put one cap full of the laundry soap in it, and slowly finished filling the jug. I put the mixture in the fill tank of my carpet cleaner and tried it out. It worked great, just as good as the store bought cleaner and made the carpet smell like a spring meadow. I won't be spending money on anymore pricey carpet cleaner, I will use my laundry soap, works just as good and it doesn't sud up anymore than what I was using. I use the clear Arm and Hammer HE kind in my carpet cleaner! It's awesome and I have white carpet, so I don't get the whole residue thing, if that was the case wouldn't my clothes be filled with residue? I've been cleaning carpets professionally and have been certified with several organizations, for 30 years. And I can tell you unequivocally that utilizing powdered Tide laundry detergent, as a pre spray for carpet cleaning, is excellent, and more cost-efficient then professional powdered pre-spray detergent. The key with carpet cleaning is to pre spray the areas and utilize no detergent at all within your machine. Go to Lowe's or Home Depot and get yourself a 2-gallon garden sprayer - mix 4 ounces of Tide laundry detergent with two gallons of hot water in the sprayer and prespray all of your carpet and traffic Lanes. Follow that with steam extraction using only hot water and an eighth cup of white vinegar per 2 gal of hot water. This acidic solution will completely rinse out the tide prespray leaving no residue. If you use an acid rinse laundry detergent is a safe and effective carpet cleaner on all carpet. Oh please do not ever use laundry detergent on your carpet! These kinds of products cause extreme residue buildup on your carpet and it will attract dirt twice as fast! 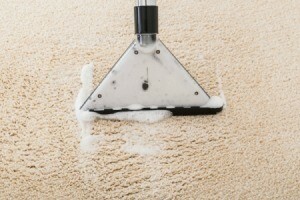 Carpet cleaning solutions have chemicals in them to prevent buildup. Also, never use those carpet deodorizer powders. The powder settles into the backing of the carpet and makes the fibers go flat, just like if you didn't wash your hair. I love being thrifty, but carpet is a big investment and should be cared for properly. 18 years experience in the floor covering industry!